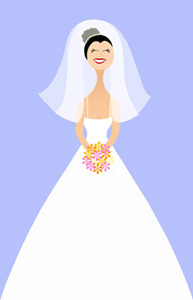 Beginning 2009 I will be specializing in and will be offering my custom cake toppers online only. I will be accepting a very limited number of commissions for all other accessories this year. Gmail and Hotmail users: What to do if you send me a message and don't hear back? It has recently become a problem that some of my responses to your inquiries are being diverted to bulk, junk and spam folders. Please be sure to check your junk mail if you are late in receiving a response. To ensure I can message you back please add info@theflirtybride.com to your approved sender addresses list in your spam filter or mark the first message you receive back that lands in your junk mail as "not spam" to ensure that future messages arrive in your in box. Also be sure to send me a phone number so if email fails to deliver I can contact you via phone. I guarantee I will not sell or share your email with any other company for any other purpose.